The world is going to need a lot more steel in the coming decades, but reducing emissions remains a daunting task. When it comes to building a low-carbon economy, the steel industry is both part of the problem and part of the solution. 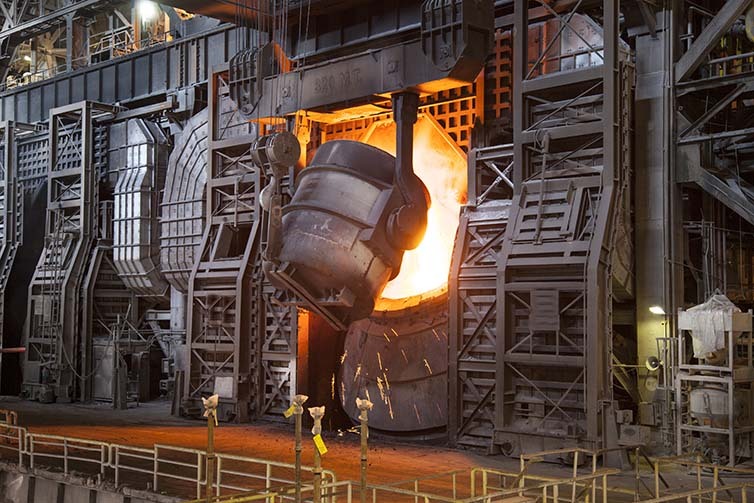 Steelmaking is energy intensive and one of the world’s leading industrial sources of greenhouse gases, generating nearly two tonnes of CO2 emissions per tonne of steel produced and accounting for about five per cent of total GHG emissions. On the flip side, steel is essential to building the infrastructure required in a low-carbon economy – everything from wind turbines and electric vehicles to mass transit systems. Another bonus with steel is that it’s recyclable. While the global steel industry says it has significantly reduced its CO2 emissions in recent decades – largely by reducing its energy consumption per tonne of steel produced by 60 per cent over the past 50 years, according to the World Steel Association – production still involves massive amounts of iron and carbon. There are also no breakthrough technologies, at least not yet, that will change the steelmaking recipe for mass production. For the industry, that means a near-term focus on continuing to reduce energy consumption as well as investing in more research and development (R&D) to find ways to clean up the steelmaking process for the future. Players across the global industry are currently working on technologies such as carbon capture and storage (CCS), using bio carbon as a substitute in the steelmaking process, as well as experimenting with algae ponds to gobble up carbon. While these technologies aren’t expected to move the needle on lowering the industry’s overall emissions anytime soon, they are steps in the right direction. 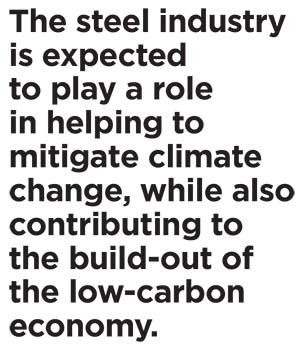 The steel industry is expected to play a role in helping to mitigate climate change, while also contributing to the build-out of the low-carbon economy. Governments have a part to play too, say both the industry and environmental groups, through policies that encourage a greater reduction in emissions and incentives to spur increased investment in carbon-cutting technologies. Some companies and countries are forging ahead regardless. An example is the $122 million (U.S.) Al Reyadah facility in the Middle East, the world’s first fully commercial carbon-capture steel project. The joint venture between Abu Dhabi National Oil Company (Adnoc) and Masdar, which launched last fall, captures up to 800,000 tonnes of CO2 emitted from Emirates Steel facilities and transfers it to oilfields for enhanced oil recovery operation. While CCS is expensive, it’s a lot cheaper than what it would cost for the industry to revamp its traditional process, says Binnu Jeyakumar, program director of electricity at the Pembina Institute. “It’s one of the few industries where carbon capture and storage might make sense,” she says. There are other technologies in the works, including a joint venture with three Swedish companies – SSAB, LKAB and Vattenfall – to develop a steelmaking process that emits water instead of carbon dioxide. Their goal, albeit a long way off, is to replace today’s blast furnace process, which uses coal and coke, with a process based on hydrogen gas. It aligns with Sweden’s overall goal to be the first fossil-free country by 2045. The project is currently being studied, with research and pilot plant trials not scheduled until 2024. It still requires significant financial contributions from the state, research institutions and universities, the companies say. The Boston Electrometallurgical Corp. (BEMC), a company spun out of Massachusetts Institute of Technology (MIT), is also working on a way to produce metal in a smelter using oxygen instead of carbon dioxide through a technology known as molten oxide electrolysis (MOE). MIT professor and BEMC co-founder Donald Sadoway says the company has raised more than $10 million (U.S.) over the past four years from governments and investors and has advanced the “de-risking” of the MOE technology for several different metal systems and industrial segments. While the success and long-term viability of projects like these may seem far off, Bataille says a day will come when the industry has no choice but to reduce its emissions, and those not working on solutions will be shut out. The global steel industry acknowledges its role in reducing emissions, as well as in helping to create the low-carbon economy with the product it makes. But it also wants help. It also calls on governments to share the expense of required R&D to come up with breakthrough technology that’s badly needed to produce a meaningful change in production emissions. “Any future climate agreement should include provisions on technology transfer, climate risk management mechanisms and international funding for public-private partnerships either individually or collectively,” the association says. CSPA president Joseph Galimberti says the steel industry has the “tremendous ability to facilitate a low carbon economy,” but that there isn’t a one-size-fits-all solution. “This is an industry that is very aware of its environmental responsibility,” Galimberti says.